When you think of tea, Africa probably isn’t the first place to pop into your mind, but Kenya is the largest exporter of tea in the world. Tea has revitalized their economy, and tea lovers everywhere became winners. 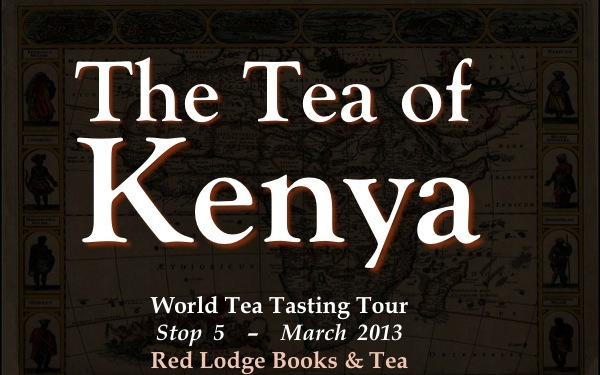 Red Lodge Books & Tea works with family owned plantations in Kenya, and was the first tea bar in the United States to serve Kenya’s unique purple tea. Kenya is known for its black tea, but with their expanding tea economy, the country has expanded into other styles. We tasted some green and white tea from Kenya, along with traditional estate-grown Kenyan black teas and with some fun and different tea you just can’t get anywhere else. A quick bit of background on Kenyan tea before we go any farther. As I mentioned earlier, Kenya is the largest exporter of tea in the world, and the third largest producer (after China and India). Largely because of the population difference, Kenya doesn’t consume as much of its product as China and India do. Kenya produces about 345,000 tons of tea per year, but consumes only about 32,000 tons of that. 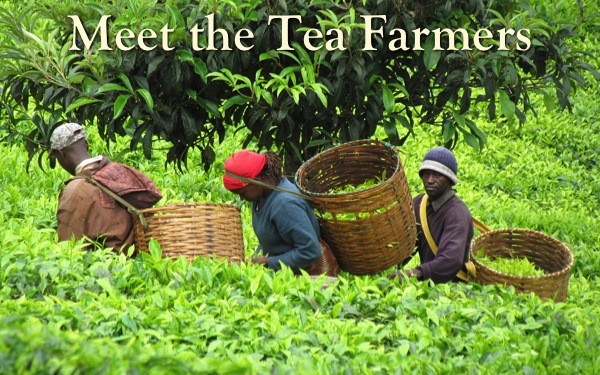 About 9.6% of the world’s total tea production comes from Kenya. Those are fascinating statistics, but let’s put some human faces on them. When I wrote my first blog post about purple tea in 2011, I was contacted shortly afterwards by a Kenyan woman by the name of Joy W’Njuguna. I had the pleasure of meeting her in 2012 at the World Tea Expo, as you can see in the picture below. She’s not actually that short — it’s just that I’m six-foot-five and I’m wearing a cowboy hat, so she does look like a tiny little thing. CAUTION: Before doing business with Royal Tea of Kenya or Joy W’Njuguna, please read my post from May 2014. There are at least a dozen companies (mine included) that report paying for tea and never receiving it! I’ve learned a lot from Joy about Kenya and its tea industry. One telling tidbit is that about half of Kenya’s tea is produced by corporate farms, and the other half by independent growers. I have a soft spot in my heart for the independents, since I own a (very) independent bookstore and tea bar. 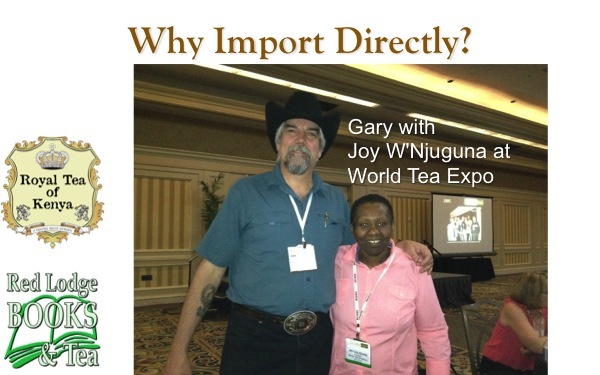 Joy, in addition to representing her own family business, is involved in a collaborative export business that represents a coalition of independent family farms in Kenya. The big producers there are focused on producing very high volumes of CTC (Crush, Tear, and Curl) tea that ends up in grocery store teabags. The independent growers are focused instead on producing high-quality handmade tea that will catch the attention of the rest of the world. Some of the people who picked the tea we tasted at this class. Silver Needle is one of the flagship teas of China. 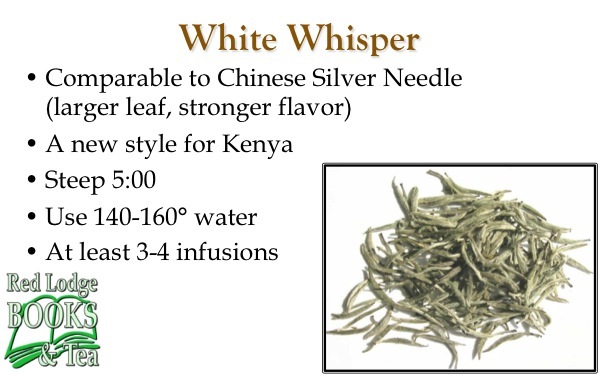 White Whisper is not a clone, but a Kenyan tea made with the same process. The vast differences in terroir make show from the first sniff. It’s richer and earthier than Silver Needle. Even at the 5:00 steep time we used, it’s less delicate. Personally, though, I love the complexity of this tea. Just pay close attention to that water temperature. You pour boiling water over these leaves and you’re going to ruin it. The first time I tried this green tea, I wasn’t really impressed. Since it’s a pan-fired tea, I followed the general guidelines for Chinese greens and steeped it for three minutes. Next pass, I read the tasting notes from Royal Tea of Kenya, which recommend a thirty-second steep. Really? Thirty seconds? Yep. That’s all this tea needs. 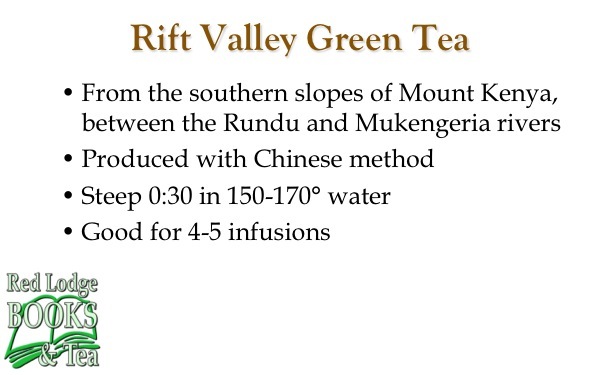 I love the fact that this tea comes from the slopes of Mount Kenya. Some of my best memories of my trip to Kenya when I was in high school center around that area and the day and night we spent at the Mount Kenya Safari Club. What a wonderful place! I’ve written about this tea before. It’s one of my favorite black teas. In this session, as in most of my tastings, I got raised eyebrows from people when I poured this and told them it was a black tea. It brews up pale red with just a touch of astringency and appeals to many oolong drinkers. 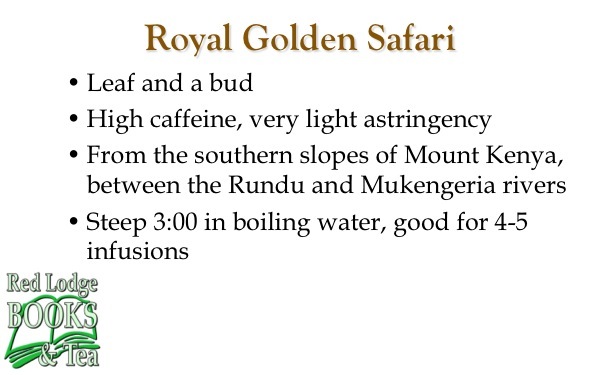 Unlike most black teas, I regularly get four or five infusions out of Golden Safari. Next, we moved on to a much more traditional Kenyan black. This FBOP is one of the ingredients I use in Gary’s Kilty Pleasure (my Scottish breakfast blend). The estate in Kericho participates in the Ethical Tea Partnership program, which I appreciate, and the tea has a deep red color and characteristic Kenyan “jammy” notes. The maltiness blends well with Assam tea, and those who take their tea English-style will appreciate how well it takes milk. 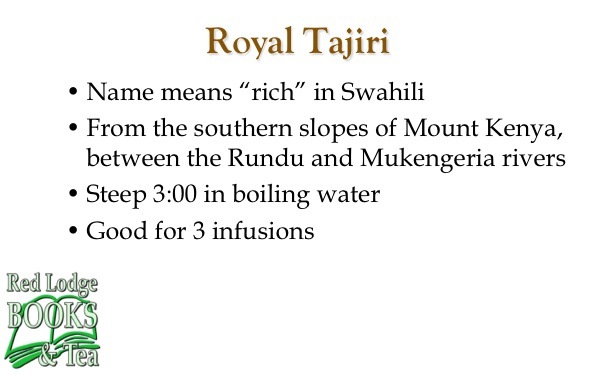 “Tajiri” is the Swahili word for “rich,” and this tea lives up to its name. The finely broken leaves mean an intense extraction. If you’re a black tea lover, this one will give you everything you’re looking for — assertive astringency, deep red (almost black) color, and a very complex flavor profile. 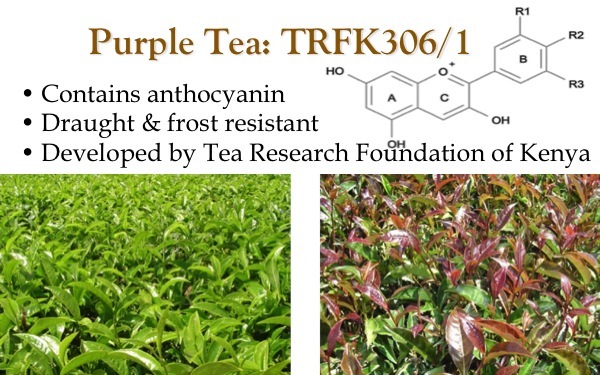 I’ve written so much about purple tea on this blog (here, here, and here) that I’ll skip the background data — although the picture on that slide is new: the tea on the left is a traditional Camellia sinensis, and the one on the right is the purple tea varietal TRFK306/1. The molecular structure in the background of the slide is the anthocyanin. I didn’t have my shipment of handcrafted purple tea yet (and the sample didn’t last long! ), so we were unable to compare the orthodox to the handcrafted. I will put up separate tasting notes on that when my main shipment arrives. I will note that we brewed the orthodox purple tea for this tasting with 170 degree (F) water instead of boiling, as I’ve done in the past. The cooler water brought out more of the complex undertones of the tea and backed the astringency down, making it more to my liking. We tasted this side by side with and without milk. If you haven’t had this tea with milk before, add a bit just to see the fascinating lavender color that the tea turns! I confess. I was bummed that we didn’t get our handcrafted purple tea in time for this event. I kind of unloaded on Joy about it, and she was good enough to find me something else fascinating and unique for this event: an African chai. The tea (a blend of purple and traditional black) is from Kenya and the spices are all from Ethiopia. We closed the tasting with this unique chai, and it went over very well. 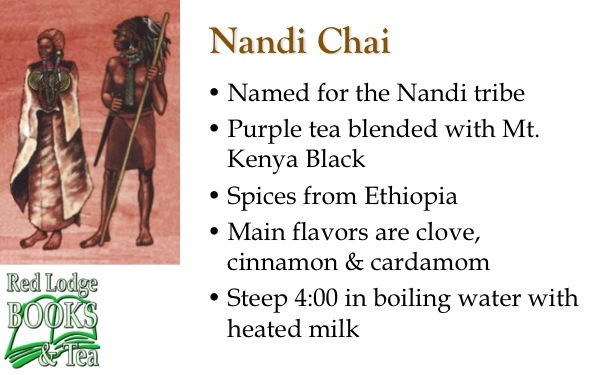 Instead of taking up half of this post talking about it, I’m going to dedicate a whole blog post to Nandi chai in the near future. This was the fifth stop on our World Tea Tasting Tour, in which we explore the tea of China, India, Japan, Taiwan, England, South Africa, Kenya, and Argentina. Each class costs $5.00, which includes the tea tasting itself and a $5.00 off coupon that can be used that night for any tea, teaware, or tea-related books that we sell. For a full schedule of the tea tour, see my introductory post from last month. Posted on 28 March 2013, in Styles & Blends and tagged anthocyanin, astringency, black tea, CTC, ethical tea partnership, Ethiopia, ETP, FBOP, Gary's Kilty Pleasure, Golden Safari, Joy W'Njuguna, Kenya, Kericho, Lelsa Estate, masala chai, Mount Kenya, Mukengeria River, Nandi Chai, purple tea, Rift Valley, Rift Valley green tea, Royal Tajiri, Royal Tea of Kenya, Rundu River, Scottish, silver needle, tea, TRFK306/1, white whisper tea, World Tea Expo. Bookmark the permalink. Leave a comment.